guffaws of laughter from all those present – including Bilic. Maksimir could hardly be described as an impressive construction; rather, Croatia’s biggest stadium is something of a hodgepodge. For example, the four stands are not connected to each other, and three of the stands – west, east and north — are straight, while the south stand is semi-circular in shape. On top of all that, there is no roof and certain parts are completely dilapidated. athletics track, has been rebuilt several times. Indeed, it was never really finished, joke critics. There has been no shortage of plans and projects to completely renovate the stadium or knock it down and build a new one. And one day, in 2012 at the earliest, the people of Zagreb will finally be able to admire their new, modern football stadium. Until then, however, the old Maksimir Stadium bears testament to a rich and proud history. Located next to the fantastic 200-year-old Maksimir Park, which covers an area of 316 hectares and is home to the Zagreb zoo, the stadium has been the site of countless important and memorable matches. 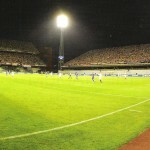 For example, on 5 May 1912, HASK Zagreb, the forerunners of Dinamo Zagreb, Croatia’s biggest and most successful club, played their first home match at the stadium, which was still known as the “Playing field of the Archbishopric of Zagreb” at the time. There were no stands back then – they were not introduced until between 1954 and 1969. In the days of a united Yugoslavia, the derbies between Dinamo and their Belgrade rivals Red Star and Partizan were exciting and dramatic affairs, both on and off the pitch. The same was, and still is, true of the classic Dinamo Zagreb v. Hajduk Split matches. 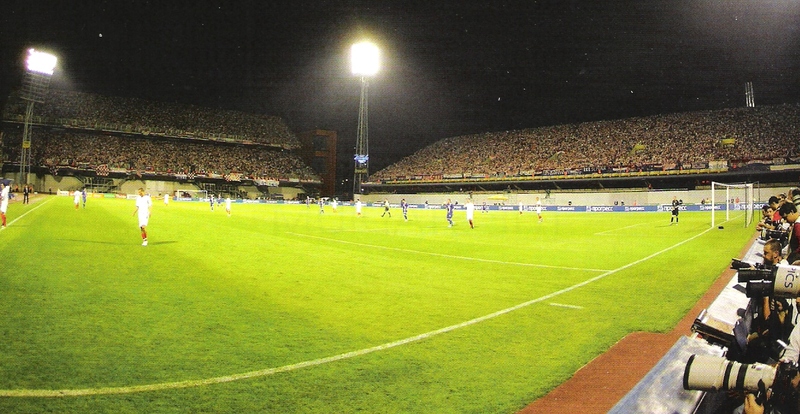 Back when there was still standing room, crowds of more than 55,000 would regularly flock to Maksimir Stadium. An appearance by Pele with his club Santos in 1969 reportedly drew a crowd of 65,000. The most dramatic events, however, unfolded during a match that in the end was not even played in full. On 13 May 1990 – a year before the break-up of the former Yugoslavia – riots broke out among fans during a championship match between Dinamo Zagreb and Red Star Belgrade, and the violence even spilled over onto the pitch. Dozens of fans, security staff and police were injured. A whole host of top-class international matches has been played at Maksimir Stadium, including the finals of the Inter-Cities Fairs Cup, the forerunner of the UEFA Cup. In 1963 Dinamo Zagreb lost 2-1 at the hands of Valencia, and in 1967 the hosts beat Leeds United 2-0. Theo Walcott (centre) makes it 2-0 for England against Croatia on 10 September, a match England went on to win 4-1. Nethetlands (3-1) and the third-place play-off between Yugoslavia and the Netherlands (2-3 after extra time). A UEFA Champions League match was played for the first time at the stadium in 1998. Dinamo, who at the time were still going by the name Croatia Zagteb, played Ajax (0-0), Porto (3-1) and Olympiacos (1-1), and a year later they came up against Marseille (1-2), Sturn Graz (3-0) and Manchester United (1-2). Other high points in the stadium’s history include Yugoslavia’s many FIFA World Cup™ and European Championship qualifiers (until 1991), and subsequently those of Croatia, the Universiadem 1987 and numerous pop concerts, including David Bowie.